"We purchased a new home in 2008 with no landscaping and a small challenging triangular lot. We had a dream of a backyard in the style of a traditional Japanese garden and knew we needed help to make that dream come true. 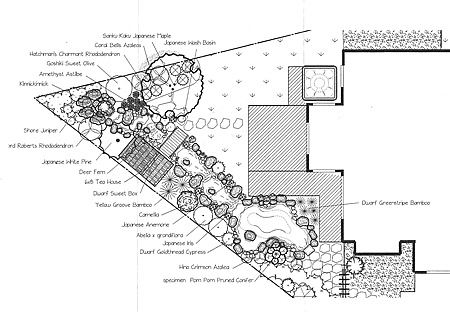 We interviewed several landscapers, and finally contracted with Patricia Gates of Garden Gates in Hood River, who was very enthusiastic about creating a Japanese style garden. After sharing ideas, magazine pictures, and plenty of creative give and take, she developed drawings that we then honed together to design the back yard of our dreams. She would do the landscaping, pond construction, and fencing and I would build a deck, tea house and bridge. Her ability to combine her visual artistry, plant knowledge, and landscape design expertise with the vision of her customer was really extraordinary. Once the design was finalized, she and her work crew then set to work, building attractive fencing with a Torii gate, a koi pond deep enough to resist herons and raccoons, a stream and waterfall, well-researched traditional Japanese plantings, and a small lawn area. Everything is drip irrigated or efficiently sprinkled. I then built a deck, an ornamental tea house, and a bridge over the stream according to Patricia's landscape design. We now awaken every morning to the sound of the stream gurgling outside our window and we spend evenings in a tranquil garden that gives us peace at the end of a day's work. We think our dreams have been fulfilled."